Jessica Field’s Maladjusted Ecosystem | Abler. 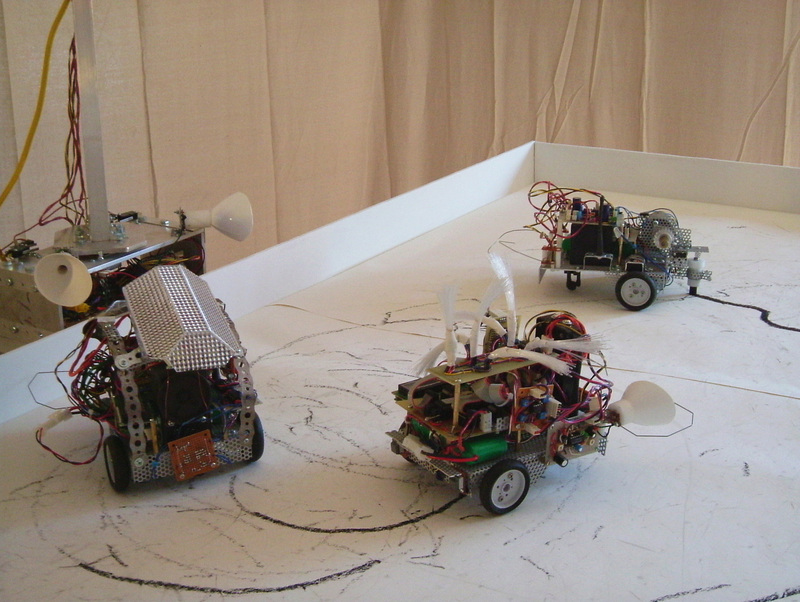 Jessica Field creates robotic social systems that play out like opera. This one, Maladjusted Ecosystem, has four doomed players: One robot, the light-seeker, is completely absorbed in finding the highest concentration of light possible. 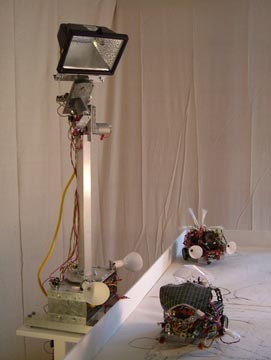 It announces its finding of a light source by a sound; that announcement cues a line-drawing robot to make its marks. A line-seeking robot, upon finding the marks made by the drawer, announces its own sound to signal its find; that sound is the sole cue for action by the fourth robot—the light-emitter. So this set-up could be a closed ecosystem, but the limitations of each player stand in the way of the true improvisation required for dynamic social interplay. 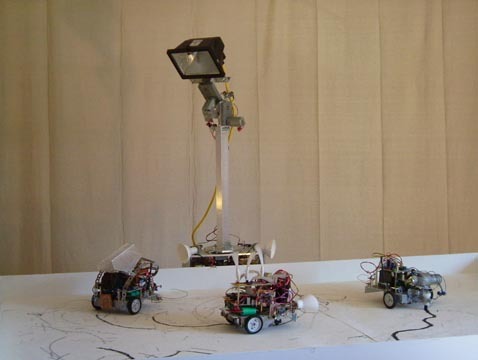 Field has set programming principles for each robot, and the result is a set of characters who cannot adapt—two are constrained by their singular, reductive search for one thing and one thing only (light, or line drawings); the other two are oblivious to the needs of these seekers who depend on them. They can’t internalize the data they’re receiving, so they can’t acknowledge the others. This piece is so chock-full of metaphors, it’s comical. And tragic. with thanks to Vague Terrain. Pingback: Leanie van der Vyver: “heels.” | Abler.